Every month at the LAMB, we have a poll that establishes our Movie of the Month. The winner is watched and discussed on the LAMBcast by a few of our members. Sometimes the winner that we review together is serious (last month’s silent German film Metropolis), sometimes it’s a classic (Blade Runner, The Shining) and sometimes it’s The Shepard’s own A Long Kiss Goodnight. But let’s not talk about Joel’s favorites… he’s still on probation for his hatred of Looper. This time, however, we had the honor of reviewing and discussing what some have called the greatest movie of all-time. And by some, I mean me. 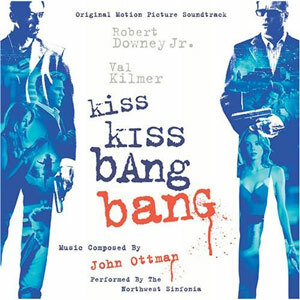 Shane Black’s 2005 noir comedy Kiss Kiss Bang Bang stars Robert Downey, Jr. and Val Kilmer and has become a bit of a cult favorite, thanks to its extremely meta nature and near-perfect script. While it didn’t set box office records or win any awards, it was a well reviewed film that has for far-too-long gone under-seen and under-discussed. But not anymore. Now, let’s see what your fellow LAMBs had to say about it. Thanks to the dynamic duo of LAMBs that sent in their posts for this edition of the MOTM. It’s also time to vote on next month’s movie. Once again, I put out the call for MOTM Champions. The gist is this: I ask for volunteers – people to select a film to be placed on the poll (up to 10 per month, as usual), then promote it on their site, Facebook, Twitter, whatever. Should their film win, they are guaranteed a spot on the LAMBcast episode where we will discuss said film. As a bonus (? ), they will also get to host that segment of the show. This month, we have nine Champions – the sites are listed along with the films in the poll in the sidebar. You have one week to vote (and promote your movies!). I’ll be putting out the call for the next MOTM in a few weeks, so stay tuned. As we do every month, the LAMBcast is tied in with the MOTM. This time around, as mentioned, Justin hosted the MOTM segment, and was joined by Nick, Dan, Kristen, and Jason of Life vs. Film, joining us for the first time. * The show can be found, of course, via iTunes – just do a search for “LAMBcast.” Also, I always post a link to the show on the LAMBcast’s Facebook page, and there’s a player there if you’d like to listen online. If you’re interested, you too can be a LAMBcaster – we love new blood! For more information on the LAMBcast, check out the topic at the LAMB Forums. Music provided royalty-free by Kevin MacLeod’s Incompetech website. Big thanks to Kevin for providing this service. Opening song by Cake. The LAMBcast loves feedback, too – if you’d like yours read on a future show, leave it in the comments section at the LAMB. Please visit and like our Facebook page, and finally, we’re on iTunes, and would still love a review, even if it’s a bad one.